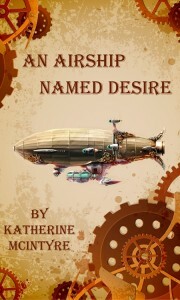 What’s a steampunk story without an airship? 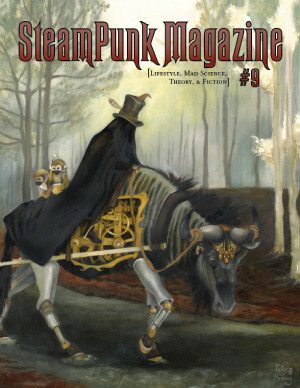 Well, it’s certainly not mandatory, of course, but an adventure that’s centered around an airship provides the perfect opportunity to showcase many readers’ favorite elements in the Steampunk genre. An Airship Named Desire carries a weighty cargo. Besides the Desire’s intrepid Captain Morris and his loyal crew, she brings along many of the staples of the ‘great Steampunk adventure’: danger; romance; the curse of the inevitable betrayal; strange and exotic locales; swashbuckling men and strong, independent women; daring rescues; dark and stormy nights; corsets and goggles and anachronisms, oh my! Our story centers around a mysterious locked box the crew’s been hired to obtain. The box is won in a daring mission, but that’s not the end of the story–in fact, the locked box draws the interest of all sorts of shady and dangerous characters. It’s the catalyst that propels the reader on a wild ride that won’t end till the last page is read. This is a rousingly good tale, thick with action, occasionally lightened by witty dialogue, and with enough smart scheming, twists and turns, and surprises along the way to keep the reader riveted. We experience the entire adventure through the eyes of Bea, as the author has chosen to write the tale entirely in first-person. It’s a tricky point of view to manage, with distinct benefits and drawbacks. On the benefit side, we are able to form a close emotional connection with Bea, who is the main character in our adventure. Nearly all of the action is ‘funneled’ down to us through Bea’s perception. Her emotions and rationale for all her decisions and actions are made clear to us in great detail. On the drawback side, we are wearing blinders in regards to the rest of Desire’s crew, as well as her enemies and various folk we meet along the way. We know very little about how events are impacting their lives. If they haven’t allowed Bea to understand their thoughts and actions, we’re left clueless as well. I found the entire cast of characters to be an intriguing variety of personalities, and I would like to have had the opportunity to crawl around inside their heads in more depth. Given the constraints of the chosen viewpoint, though, I enjoyed the large and diverse group of people that contributed in their own unique ways towards the completion of Desire’s mission. 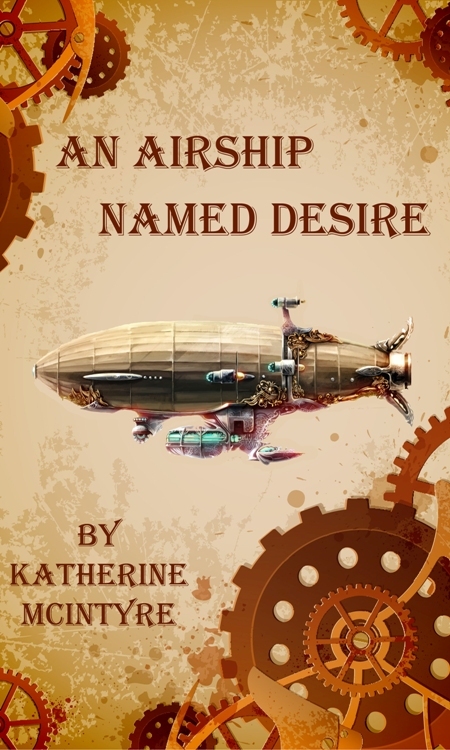 Author Katherine McIntyre has written poetry and prose for various publications, but An Airship Named Desire is her first published novel. I suspect that subsequent novels will benefit from experience gained while writing Desire, and perhaps she will choose to step away from first-person storytelling. I hope so, as she has proven her skill at telling a rich, well crafted tale from beginning to end. In addition, I’d love to see her trim back her dependence on overly descriptive, drawn-out action sequences, and I’d definitely hope to see less use of frequent–and often downright bizarre–similes. (For example, “Their shadow stretched along the crevasse between the warehouses like a mutated black alligator stomping in an aluminum river.”) McIntyre has the chops to write a strong storyline. Now it remains to be seen if she will allow her future work to depend less on novelty styling and simply stand on its own merit. Count me in for the next book.